The 50 Best U.S. Cities for Employment Satisfaction - 24/7 Wall St. The best company to work, the worst, and the new “50 Best U.S. Cities for Employment Satisfaction” study from industry leading employee opinion group Glassdoor. The actual list would be better called a review of the “50 largest cities,” and which ones have the most favorable work environments. Or, as researchers call it sometimes, the Glassdoor Employment Satisfaction Report Card by City.” Pick the best title, as if it were a contest. No one should be surprised that these cities are mostly very affluent have highly educated residents, good climate and likely bicycle paths and public education as well. Texas and California get more than their fair share of cities, but they have more than their fair share of the national population. The cities near the bottom of the list, are probably ones that most people who have the luxury to pick and choose will ignore. Detroit is near the bottom. So are Las Vegas, Buffalo and Milwaukee. Not has much to recommend these other than bad real estate prices and residents who want to leave. 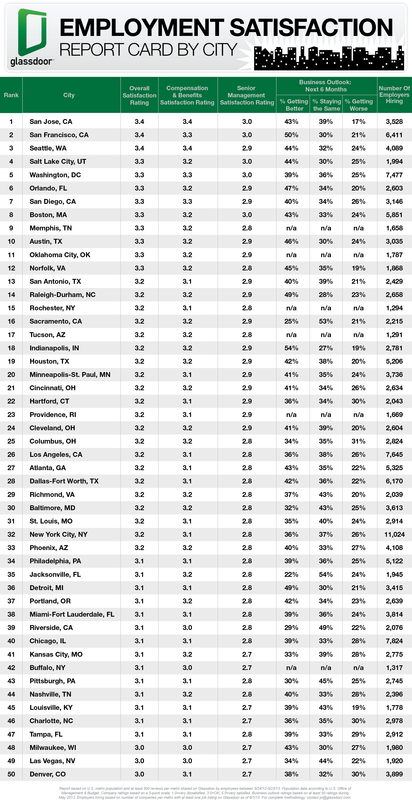 The Bay Area takes the lead as San Jose, CA and San Francisco, CA take the top two spots. Interestingly, both cities are home to five companies that made Glassdoor’s Top 50 Best Places to Work for 2013 report – San Jose (Google #6, LinkedIn #14, Agilent Technologies #30, Intel #31, Apple #34) & San Francisco (Facebook #1, Riverbed Technology #3, Chevron #13, Workday #19, Salesforce.com #22). Rounding out the top five cities for overall employment satisfaction are Seattle, WA, Salt Lake City, UT , and Washington, DC. This report is based on U.S. metro population and at least 500 reviews per metro shared on Glassdoor by local employees over the past year.